toString() method belongs to object class. By default it will be called once whenever we try to print object. toString() method by default will print classname@hex representation of hashcode. We can override this toString() method from object class. Advantage of toString() method in java. When ever we try to print object by default toString() method will be called and print classname@HEX_hashcode. We can represent object in String format using toString() method. if we want to represent string representation of object then we need to override toString() method in our class and return values of the object as a String. Java example program to print object without using toString() method. Lets see an example program on printing object of a class. In the above program when we print object of ToStringDemo class it prints ToStringDemo@2a139a55. It means when ever we print object of the class toString() method will be called and by default toString() method print classname@HEX_hashcode. To test this now we will override the toString() method and prints object of the class and if it calls our method then we can understand that when ever we print object by default toString() method will be called. Java example program to print object by overriding toString() method. In above example when we print object it executed overridden toString() method. By overriding toString() method we can represent object in string form. toString() method used to convert data to String type. 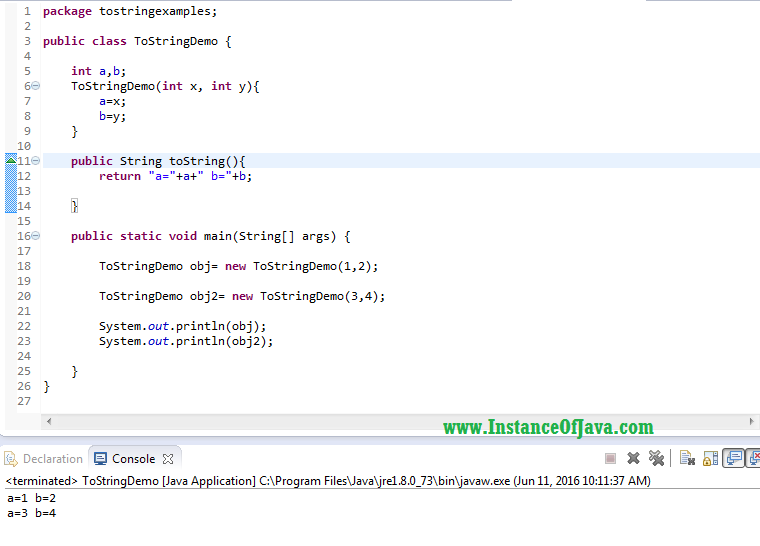 Java example program to convert integer to string using toString() method. Java example program to convert Float to String using toString() method.